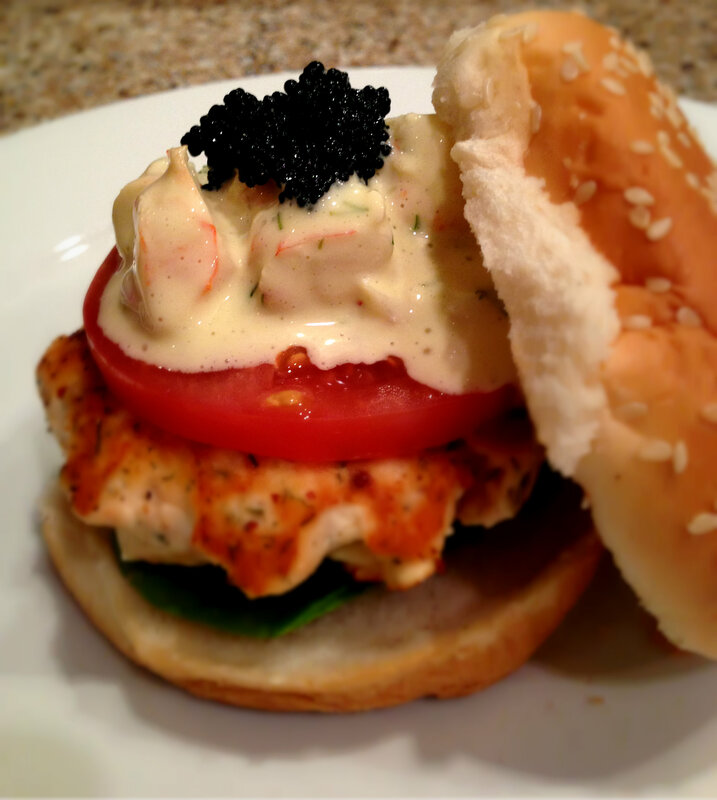 Swedish Creamy Dill Prawns with Caviar and Salmon Burgers…or simply Skagenröra! I always try to plan roughly what I am cooking when I go grocery shopping so I actually had in mind to make salmon burgers sometime this week or crabby patties as the kids like to call them :). Who ever read my post from yesterday maybe realized I made wasabi aioli for the entire state of Illinois so I had a little leftover for this evening. Wrapping my head around what to do with it I thought I make a simple “skagenröra” and if you ask any person from Sweden they would say it is a classic! How to: If you not already have the aioli here is the recipe for it https://mrsmalin.com/2013/02/19/smoked-salmon-and-shrimps-with-a-warm-brussels-sprout-salad-and-wasabi-aioli/. If you not lactose free I would recommend adding the sour cream. Chop the prawns, red onion and the dill and mix it into the aioli and season with salt, pepper and the lemon juice and store it in the refrigerator. Mince the salmon in a kitchen mixer and add the rest of the ingredients (not spinach and tomato) and from patties fry them in a frying pan or grill them (I can’t wait for the winter to be over). 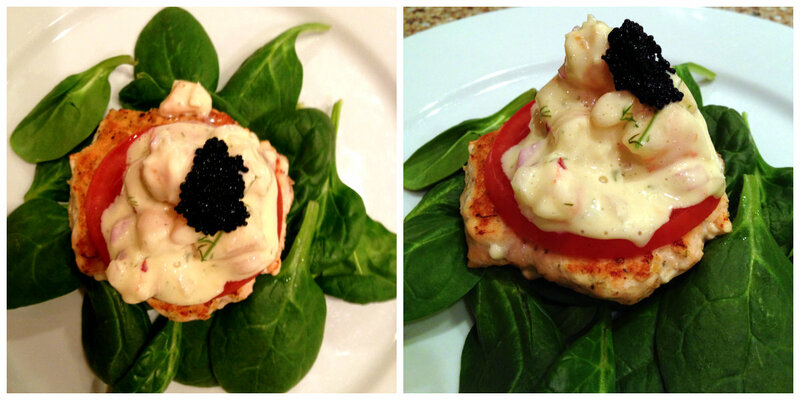 Serve the Salmon burgers on a bed of spinach, a slice of tomato and “skagenröra” and garnish with the Caviar. The rest of the family also got their buns :). 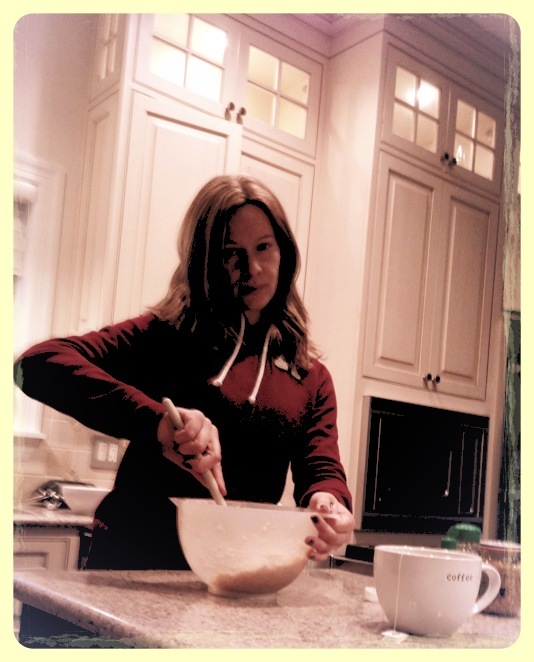 This entry was posted in Recipes and tagged burgers, dinner, fitness, lactose-free, lifestyle, low-carb, recipe, salmon, weight loss, weight training by Malin. Bookmark the permalink.